One of the missions of the Delta Alliance is to support the development and proliferation of new approaches in delta management through research, exchange of best practices and an exchange of concepts and ideas. This toolbox is one way to promote such an exchange: it provides an overview of methods and technologies embedded in an overall approach to the management of complex delta systems. The toolbox for Adaptive Delta Management provides guidance in two ways: The Delta approach and Gathering more knowledge on separate elements of the approach. The aim is to provide tailor-made solutions worldwide by amending top-down knowledge with bottom-up knowledge. The toolbox comprises of factsheets on existing tools and examples of their application. Some examples of tools are: a checklist; best practices; Adaptation Pathways; oyster reefs, building with nature, bubble screens, models for calculating salt intrusion, scenarios, decision support systems, governance tools, interactive tools, and so on. These tools are organized more or less in the different steps of a proves as indicated in the figure below. This report provides an overview of new approaches emerging in several deltas that can be labelled under the heading of Adaptive Delta Management. 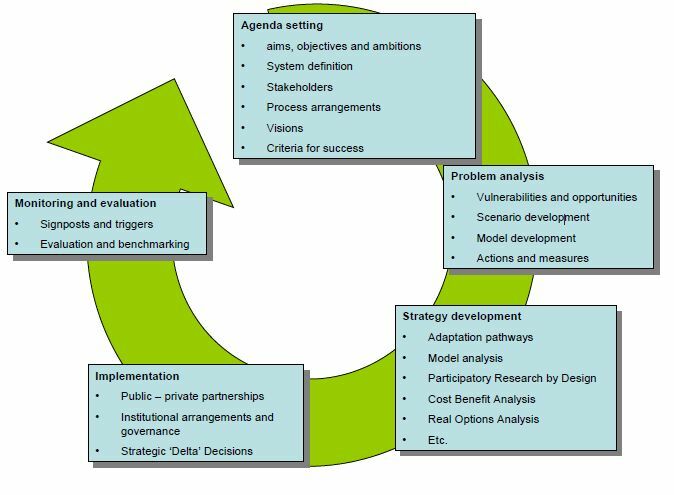 Adaptive management can be defined as a structured, iterative process of robust decision making in the face of uncertainty, with an aim to reduce uncertainty over time via system monitoring.